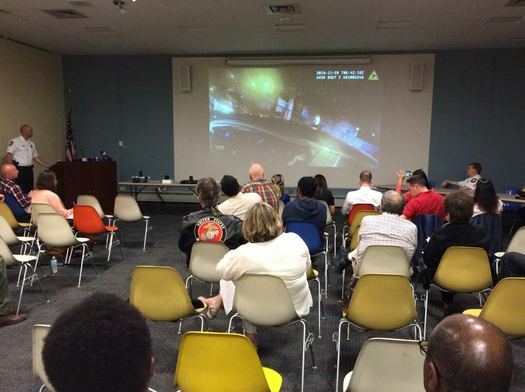 A public meeting this past May about the body cameras. APD has held a series of meetings over the last year to talk about its plans for body cameras, and many the details of the program consistent with what was introduced at a meeting this past May. 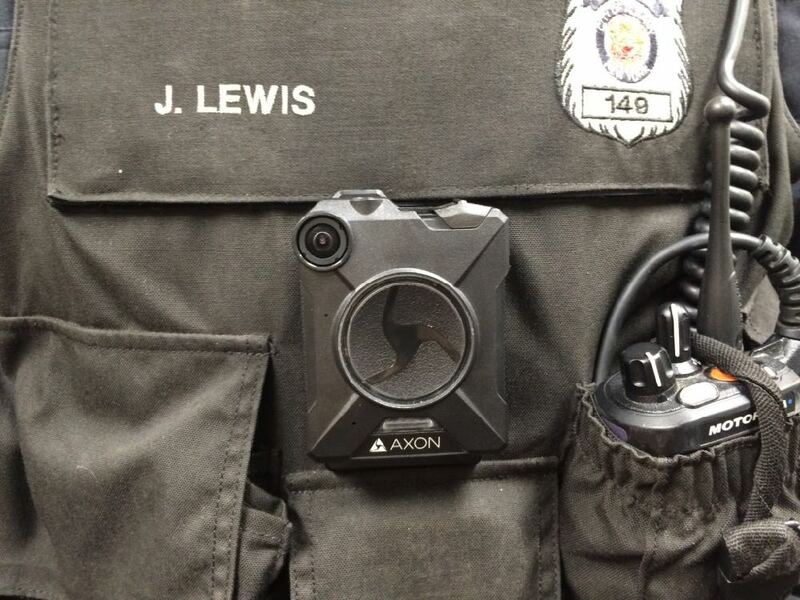 + Body cameras will be distributed to all officers working patrol, traffic safety, and neighborhood engagement units for use during their shifts; detectives and plain-clothes officers will use the cameras during field operations and enforcement actions; K-9 officers will use them during enforcement actions. + Officers are required to immediately turn on the cameras when they're dispatched on a call or prior to interacting with a person during a stop. + There are a few situations in which an officer is not to record an interaction with a member of the public. Among those situations: when interviewing a victim of sexual assault or juvenile victims of crime. + The video will be held for 180 days, which is the time window in which a complaint can be filed with the Albany Citizens' Police Review Board. Video will not be reviewed by anyone outside the department unless a complaint is made via the CPRB. (The video is theoretically subject to the Freedom of Information Law, but in practice it will often be protected by interpretations of state civil service law that regard the video as a personnel record.) Video will also be released to district attorney's office and for court proceedings. + Here's the department's whole policy for the cameras. APD had originally planned to start rolling out the cameras to officers for regular use this past summer. Acting chief Robert Sears said Friday that the program had gotten caught on some bureaucratic snags during the purchasing process, which held things up for a few months. The department will be distributing the cameras to 10 officers at a time. (Officers at Center Station will get the cameras first.) Sears said the department will deploy a group of cameras, make sure the cameras are working and officers are using them properly, and then deploy the next group of 10. He said he didn't want to provide a goal date for the full rollout because the department is focused on getting everything working correctly rather than meeting a timeline. "Slow and methodical, in our research, is the best way to do it," said Sears. 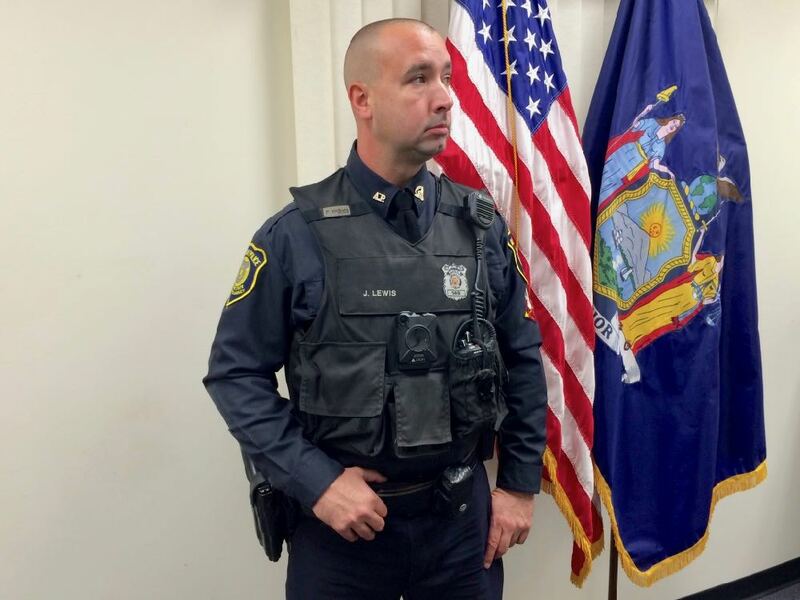 Albany will join Saratoga Springs among local police departments that use these sorts of cameras. And Troy is apparently moving toward them, as well. Officer Jimm Lewis demonstrated the new camera on Friday. The police department conducted field tests of body camera systems from four different vendors over the past year. It settled on a system from Axon (formerly known as TASER). Said Robert Sears of the choice: "It consistently worked best out of all the options." APD will be uploading the video to a cloud storage system. It's that storage that represents the bulk of the costs of the system. The city received $133,305 grant from the federal government to get the program up and running. The estimated cost of the system for the department for an entire year is about $300,000. No camera can give a total view of what happens in a situation, and it will in some ways always reflect the viewpoint of the user. Even with a wide angle lens, some things aren't going to make it into the picture. For example, in the case of a body camera, it is looking "out" from an officer -- so it's usually not going to capture, say, an officer's facial expressions or body language. On Friday, Robert Sears, the acting chief, acknowledged the cameras will have limitations in what they capture. "The body-worn cameras are going to be right here [pointing to chest]. You're going to turn them on. And then whatever happens in front of the camera happens in front of the camera," he said. "We can't train our people to move around and point it in different directions. It's just not feasible." That limitation speaks to the reality that officer body cameras are a tool -- one that could end up being very helpful in some situations, but they're not going to fix all the problems and tensions that arise between police and the public. Our experiment suggests that we should recalibrate our expectations of BWCs [body-worn cameras]. Law enforcement agencies (particularly in contexts similar to Washington, DC) that are considering adopting BWCs should not expect dramatic reductions in documented uses of force or complaints, or other large-scale shifts in police behavior, solely from the deployment of this technology. The New York Times had a good article putting the study results in context and discussing some of the reasons why the study might have shaken out the way it did. "The thing that we worry about is that the community might think that body cameras are a sort of panacea that are going to solve all the problems with the relationships between the community and the police -- and that's not going to happen ...It's going to take a while for people to understand that we still have to rely on human beings, their attitudes, how they relate to people, their biases, their prejudices." She added, emphasizing the importance of training: "I believe in that personal relationship that has to develop, that police officers have to grow, have to understand the population they're policing." So it's important to note the addition of body cameras isn't being done in isolation. Albany set up its own police academy in part so it could emphasize the importance of community policing principles. And mayor Kathy Sheehan has emphasized the importance of training and community policing during her first term. Because whatever the tech, these situations are ultimately about the people involved and how they react. As long as the wearer cannot turn off the camera during an altercation this is a good thing.